A 2012 study published in the International Journal of Engineering and Technology found a strong correlation between workplace ergonomics and workers’ productivity. When natural motions of workers were constrained by poor workstation design and layout, it made people less efficient. The study recommended modifying workstations to allow for good body postures and good tool-work contact. A basic industrial workbench can address these issues in many warehouses because it can be customized to your business needs. The design is modular so the workbench is greatly configurable with a variety of options, which makes it a versatile choice. It can handle up to 1,000 pounds capacity so it’s suitable for even the heaviest tasks. It’s a good choice for assembly, inspection, packing, repair, lab and technical operations. If there is one phrase to describe cantilever workbenches, it’s “built to suit.” Ideal for vital warehouse areas (assembly, picking, shipping, receiving), the cantilever workbench can be configured with the exact options the application requires. Having all the tools with arm’s reach within a workstation creates efficiency and improves ergonomics. Available options include steel shelves, dividers, bin rails, lights, drawers, power strips, whiteboards, and flat screen display arms. In order to maximize the benefit of cantilever workbenches, work with employees to think through their day-to-day responsibilities and tasks to create the ideal workspace. While basic and cantilever workbenches are highly customizable, there are also options designed with specific roles in mind. Among them are modular shipping and receiving workstations. 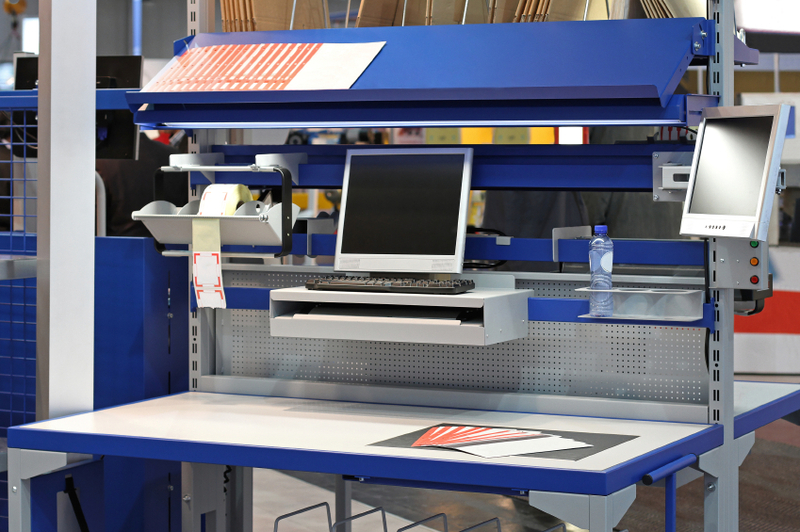 With these workstations, typical tasks, such as accessing shipping schedules, preparing manifests, or weighing packages, can be completed efficiently and ergonomically. Organization is taken into account so items like computers, printers, and scanners have a designated location within arm’s reach. With a better designed workstation, the goal is to simplify shipping processes and decrease shipping times. 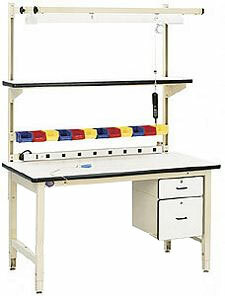 While a standard shipping workstation is available, most can be customized to suit specific needs. A proper workstation designed with ergonomics and the role in mind is an easy way to improve ergonomics, prevent worker injury, and increase efficiency within the workplace. Optimizing a workspace may seem like a small detail, but it can make a big impact on the warehouse.